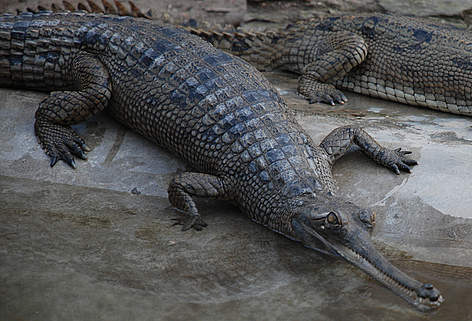 I like learning more about different types of reptiles and one of the strangest looking is the gharial. Gharials are one of the largest species of crocodile in the world and can grow up to 6 metres long. They get their name from the bump on the end of the male’s snout which looks like an Indian pot called a ghara. Their very long snout is full of over 100 sharp teeth and is used to catch fish. Unlike most other crocodilians, gharials have very weak legs and are unable to walk properly on land. Instead they slide themselves along. At breeding time, the females lay 20-90 eggs in a sandy nest. After the babies hatch, they call to their mother who then helps to dig them out. The mother looks after the babies for the first few weeks of their lives. Gharials used to be found in India, Nepal, Bangladesh, Pakistan, Myanmar and Bhutan, but due to hunting, loss of habitat and excessive fishing, they are no longer found in much of their range. They are now considered critically endangered with only about 200 left in the wild and they can only be found in India and Nepal. Are there any other interesting facts that you would like to share about gharials?